After several strong sessions and a broader U.S. stock market nearing a short-term overbought condition, it’s no surprise that stocks largely consolidated on Tuesday. 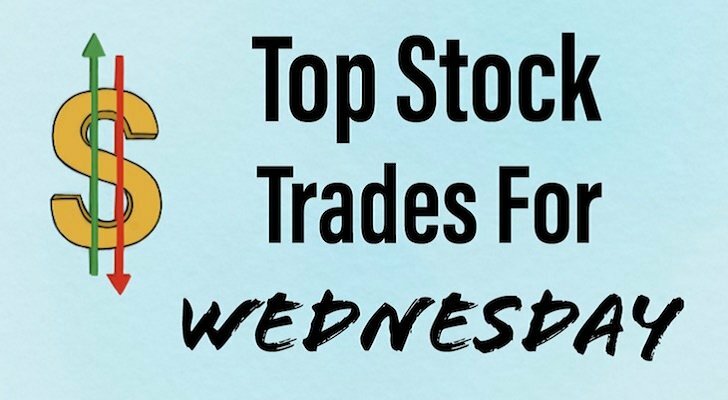 There were still a few big movers though and we’ll look at some of them as part of our top stock trades for Wednesday. Twitter Inc (NYSE:TWTR) erupted another 5% on news it would be added to the S&P 500. TWTR stock is now up 16% over the last five trading sessions and 28% over the past month. As much as I do like Twitter, I can’t be a buyer near these levels. Admittedly, the stock did blow through $37, which I thought would be resistance. Still, with an RSI over 80 (blue circle) and a name up this much, I’d rather wait for a pullback. Bulls will have a better risk/reward opportunity if they buy between $36 and $37. Thanks to some downbeat guidance on its revenue per available seat mile, Southwest Airlines Co (NYSE:LUV) found its stock moving lower Tuesday. Shares remain trapped in a downward channel, something we warned investors about back in April when it looked like LUV was gaining altitude. So what now? 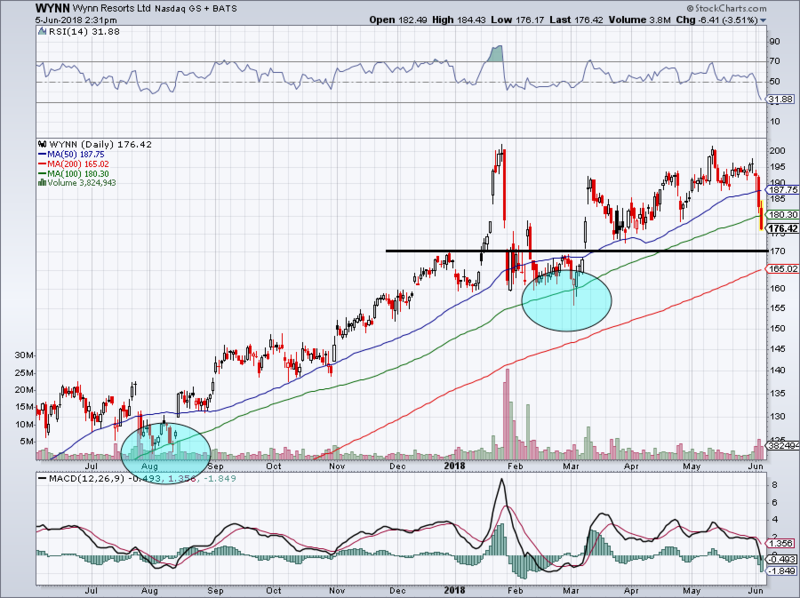 Currently below all three major moving averages and still trapped, LUV stock needs to see $50 hold. If it doesn’t, it will remain in its downward channel with bulls’ next hope being that the $46 to $48 level holds up. Aggressive longs can take a shot right here and bail if $50 fails to hold. 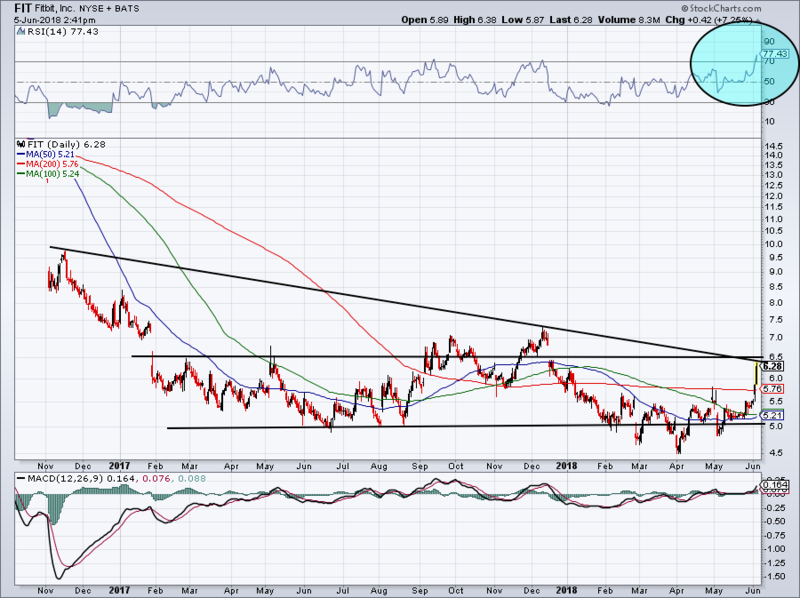 Conservative longs can buy on a breakout of LUV’s downward channel. After four decades as executive chairman and/or CEO, investors can’t be too surprised that Howard Schultz is finally stepping down at Starbucks Corporation (NASDAQ:SBUX). Like Schultz’s decision, it’s no surprise shares are reacting negatively, down about 2.5% on the day. Bulls are likely thankful it’s not worse. 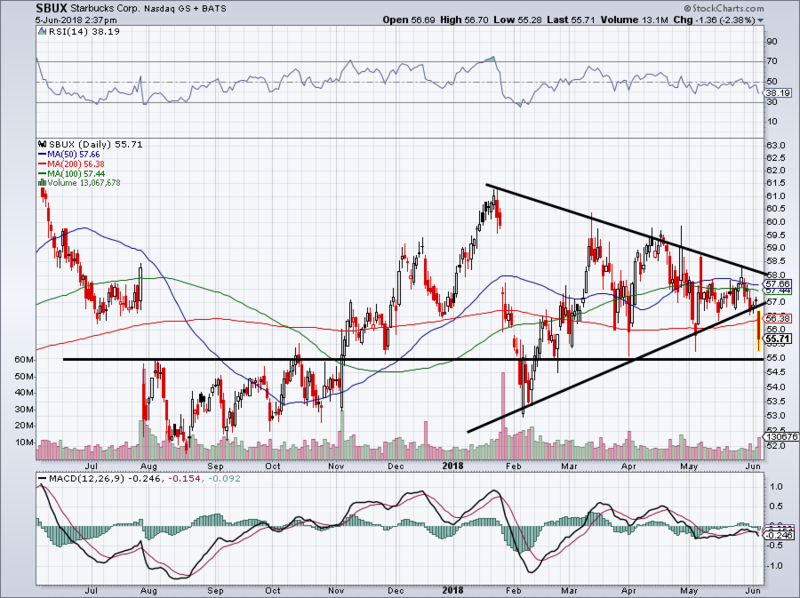 There was a trend-line of resistance weighing on SBUX, but it was also putting in a series of higher lows. That was, until Tuesday when shares broke down. If $55 doesn’t hold up, it puts the 2018 lows of $53 back on the table. Falling almost 10% since Friday, it’s been a tough few days for Wynn Resorts, Limited (NASDAQ:WYNN) shareholders. The stock knifed right through its 100-day moving average, a level that has been solid support over the past 12 months. While not shown above, drawing a trend-line on those 100-day-pullback-lows puts possible support near $175. But that’s not a strong enough case for me, which is why it’s not included above. To be a buyer of Wynn, I need one of two things to happen. 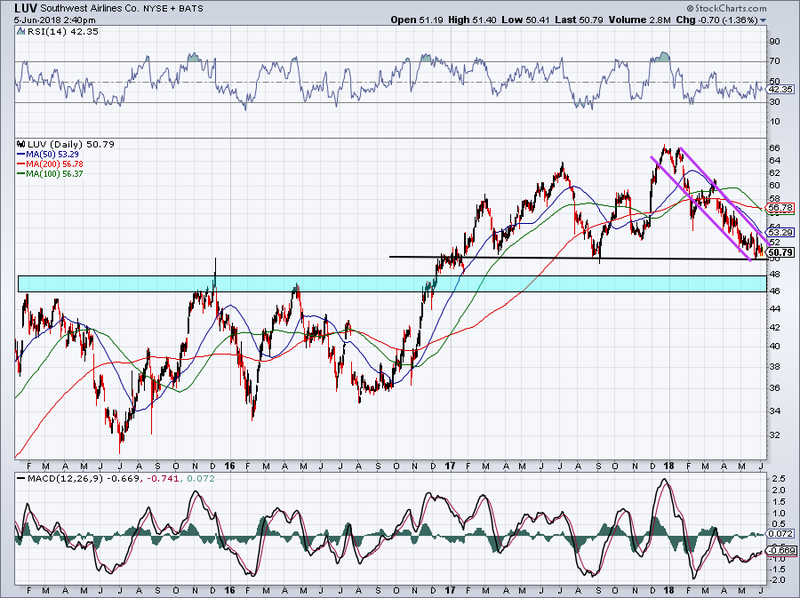 Either a pullback to $170 needs to hold as support or shares need to get back above the 100-day. If neither of those happen, a test of the 200-day moving average seems likely and should at least be good for a bounce. Up 17% in five days, Fitbit Inc (NYSE:FIT) is starting to turn some heads. 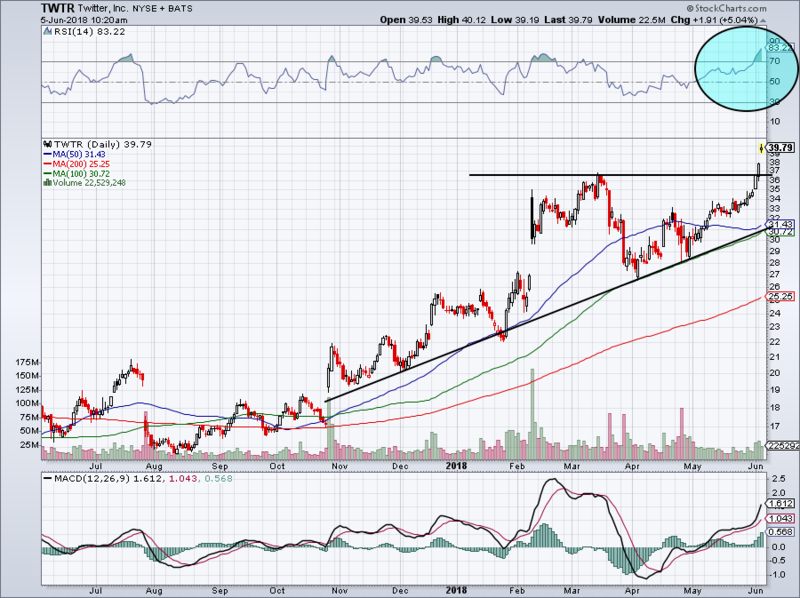 It is very constructive to see FIT get above and more importantly stay above the $5 level. While the last five weeks have been notable — with shares climbing above $5, through all three major moving averages and bursting through $6 — I’d be cautious about buying right now. Up 9% Tuesday, part the buying has to be shorts looking to cover, given that there’s a 15% short interest in the name. The momentum seems tempting from the long side. However, there’s too much resistance nearby and the RSI (blue circle) is too high for me. A pullback and some consolidation above the 200-day moving average would be best for bulls or a push through $6.50 followed by some consolidation. Bret Kenwell is the manager and author of Future Blue Chips and is on Twitter @BretKenwell. As of this writing, Bret Kenwell was long SBUX. Article printed from InvestorPlace Media, https://investorplace.com/2018/06/5-top-stock-trades-for-wednesday-morning-fit-luv-sbux-twtr-wynn/.